Latest Rasmussen Reports Puts Obama Approval at -8 | Virginia Right! The “anointed one” dropped 3 more points overnight. It seems that people are beginning to see that Obama is not a Messiah, but simply a false god. And one that is terribly inept at the business of running the country. The same pool shows his overall approval rating is down 2 more points to 51% with 47% disapproving of his performance. It sort of reminds me of a lot of Dallas Cowboy fans. There are loyal fans that never waiver, but they have a lot of fair weather fans that flock in when they are doing well, and jump ship as soon as they are eliminated from the playoffs. It seems Obama appears to be headed for a losing season and no playoffs. 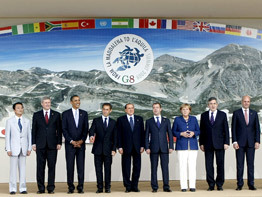 Is anyone else curious as to why there are 9 people in this picture of the G-8 summit participants? Did Team Obama not get the memo? Perhaps it’s one of those things like Crosby, Stills, Nash and sometimes Young. I am aware the G-8 does not like what Obama has done to the Dollar, maybe he was replaced and no one wanted to hurt his feelings.